Watch Empire Season 5 full episodes online, free and paid options via our partners and affiliates. On Empire Season 5 Episode 16, a special day for Jamal and Kai might be ruined when AUSA's Meghan Conway continues to pursue the Lyons by any means necessary. "A Wise Father That Knows His Own Child"
On Empire Season 5 Episode 15, Jeff Kingsley seeks the truth about what really happened between Lucious and Tracy Kingsley as the Feds close in. On Empire Season 5 Episode 14, with the news of Andre's health, the Lyon family does everything to support him and Cookie and Lucious hash out their wrongdoings. "Hot Blood, Hot Thoughts, Hot Deeds"
On Empire Season 5 Episode 13, when Empire launches its national tour in Philly, things heat up and egos clash and Treasure has an embarrassing mishap on stage. On Empire Season 5 Episode 12, Cookie is offered a career game-changer while Jamal works diligently to try to make Tiana and Treasure's track a success. On Empire Season 5 Episode 11, Lucious and Cookie try to track down the money Eddie stole and the Lyons strategize on how to clean up Kingsley's mess. 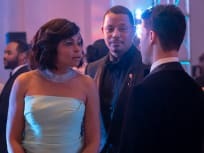 On Empire Season 5 Episode 9, Kai's research for an expose on Empire uncovers some dirty activity and the financial security of the Lyon family is on the line. "Master of What is Mine Own"
On Empire Season 5 Episode 6, Cookie and Lucious bet on another to see who can find a new talent first in an effort to sign more artists to the label. On Empire Season 5 Episode 4, Andre tries to prove himself useful while Cookie and Portia attempt to sign Devon, who has just the sound they're looking for. On Empire Season 5 Episode 3, Cookie and Lucious need the whole family and some old allies to make serious sacrifices in order to get back in the music game. On Empire Season 5 Episode 2, Cookie and Lucious receive interesting offers as they deal with the difficulties of launching an artist without Empire resources. On Empire Season 5 Episode 1, two years after losing Empire to Eddie Barker, Cookie and Lucious find they are still attempting to pick up the pieces. To hell with him and his Steve Harvey outfits. Permalink: To hell with him and his Steve Harvey outfits. Cookie: Damn. It’s hot in here. Can’t we get the AC fixed? Lucious: If you got $50,000 to pay for it. Permalink: If you got $50,000 to pay for it.